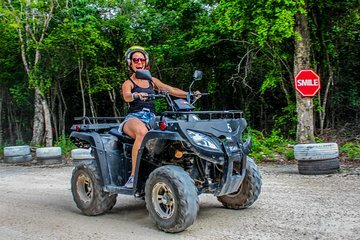 Experimente la sensación serena y única de nadar en un cenote hundido en esta visita guiada de un día completo que incluye una excursión de ATV. Aprenda a maniobrar y operar su ATV y diríjase al circuito privado de la jungla con la ayuda de sus guías. Refrésquese después de su viaje con una zambullida en un encantador cenote lleno de agua clara y tibia. We visited this location for atv tour and they have two different cenotes one is open the other one is a cave cenote we were able to view the local cenote but we didn’t get a chance to view the cave cenote I was looking forward to that. Atv tour was great different dirt roads about 45 minutes. We had to wait 1 hr and 30 min after our tour for pickup but again we had more than enough time left over because we didn’t do the site seeing for the other cave. I'd absolute recommend this tour. We actually ended up going to a cenote near Tulum where there was an ATV park as well. Rafael our guide was terrific spoke great English and was great about making sure I stayed safe given it was my first ATV ride ever. My husband and I actually ended up being the only two on the tour so it was a bit more personalized. The centoe we had the option of doing more of a cave-like one or an open air. We opted for open air, and that was just beautiful, you could see to the bottom of the swimming hole and there were lots of small fish swimming around as well. I would absolutely do this tour again and highly recommend.